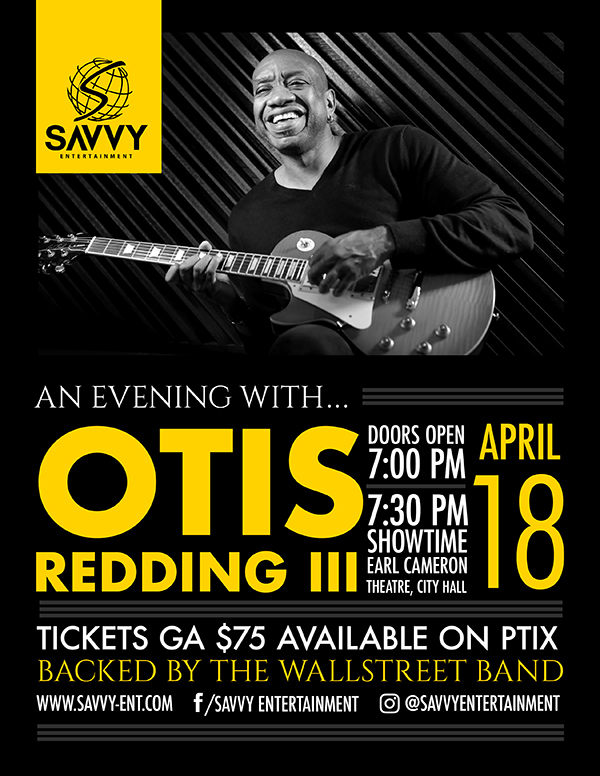 “Falling in love with old music is beautiful,” says the organizer of an event dubbed ‘An Evening with Otis Redding III,’ which is set to take place on Thursday, April 18 at the Earl Cameron Theatre. A spokesperson said, “Redding Jr, an iconic southern soul performer and producer, was well known for songs such as These Arms of Mine and Try a Little Tenderness. But it was his hit Sittin’ on the Dock of the Bay that flew to the top of the charts a month after he was tragically killed in a plane crash on December 10, 1967. Redding was 26 years old. “His father’s music has touched his life in many ways. He states, ‘carrying on the legacy is a priority, but not by singing his music only, participation with my family is the key to that.’ The family also have the Otis Redding Foundation and host a summer camp for kids in songwriting. Redding is looking forward to performing in Bermuda and grooving to great music from the past with the awesome Wallstreet Band. “Redding will be backed by Bermuda’s own Wallstreet Band and the audience will also be treated to a number of talented Bermudian entertainers, including vocalist Olivia Hamilton, Vance Goater and Sounds of Sweetness.